Search giant Google has finally launched the next Nexus smartphone (rumours about the same were doing the rounds for some time now), along with the latest version of its Android operating system nicknamed KitKat. 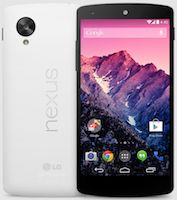 The device, built in partnership with LG, is called Nexus 5 and runs Android KitKat out of the box. In terms of pricing, the 16GB model will be available for Rs 28,999, while the 32GB model has been priced at Rs 32,999. While the smartphone has already been launched in countries like the US, Canada, the UK, Australia, France, Germany, Spain, Italy, Japan and Korea, an exact India launch date is not available of now. According to the company, the smartphones is the slimmest and fastest Nexus phone made till date, and comes with an advanced new lens that captures more light for brighter night and sharper action shots. Here is a look at the specifications of the device. Nexus 5 has a 4.95 inch full HD IPS capacitive touchscreen display (1920x1080 pixel resolution) with 445 ppi and runs on the Android 4.4 KitKat operating system. It is powered by a 2.3 GHz quad-core Qualcomm Snapdragon 800 CPU and 450 MHz Adreno 330 GPU. It comes with 2GB of RAM and will be available in 16GB and 32GB of internal memory options. The device has an 8 mega pixel autofocus rear camera (with optical image stabilisation) with LED Flash that can record full high definition (HD) videos at 30 frames per second, and a 1.3MP front facing camera for video calling. A new HDR+ mode automatically snaps a rapid burst of photos and combines them to give you the best possible single shot. On the connectivity front, it has Bluetooth 4.0, Wi-Fi , 3G and LTE (depending on the region), and comes with a microUSB port. The dimensions of the device are 69.17mm x 137.84 x 8.59mm and its weight is 130 gm. LG has provided a 2,300 mAh battery in the device, which it claims will provide 17 hours of talk time, 8.5 hours of internet browsing on Wi-Fi, and 300 hours of stand by time. It has Near Field Communication (NFC) and will be available in black and white colours. Read here to compare it with its predecessor the Nexus 4. Another plus for a device is that being a Nexus smartphone, it will be among the first ones to receive any future Android software updates. The company is also offering a number of accessories like bumper case (available in red, black, white, and yellow) and QuickCover (available in white and black), which have been priced at Rs 2,499 and Rs 3,299 respectively. In terms of competition, it will compete with the likes of Nokia Lumia 925 (Rs 28,990), HTC 8X (Rs 28,500), LG Optimus G (Rs 28,499), Sony Xperia ZL (Rs 29,350), and Lenovo K900 (Rs 28,999), among others. We personally feel that the company has priced the device very competitively in the Indian market, and considering its specifications, is definitely worth a buy.